Register now for The Five Behaviors of a Cohesive Team™ Facilitator Accreditation! Want to lead your organization along the path to building truly cohesive, high-performing teams? With the Five Behaviors of a Cohesive Team™ Facilitator Accreditation, you will gain the confidence and the credentials to lead any team through The Five Behaviors™ program with ease. This is a very different training workshop. Sessions can get heated. Participants can grow emotional. 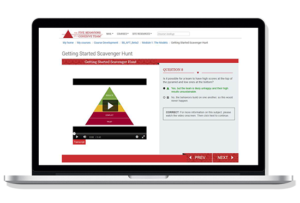 By earning Facilitator Accreditation, you will hone your facilitator techniques and instincts to effectively navigate any Five Behaviors team session even when unexpected, challenging circumstances arise. This five-week blended online learning course combines self-directed study and live instructor-led sessions. The deadline to register is four business days prior to the opening of the course. Register early as courses may fill up. Contact us at 847-259-0005 to ensure seats are still available. **Price includes the Five Behaviors facilitation kit. Be sure to provide a good shipping address. If you already own the facilitation kit, please contact us to purchase the accreditation without the training materials. We can invoice you. Cancel 7 days prior to the start of the course for a refund of the cost of the training. We will refund the cost of the facilitation kit minus a restocking fee after receiving the return (must still be in shrink wrap). Cancel 1-7 days prior to the start of the course for a partial refund for the cost of the training and no refund for the kit. No refunds will be available if you cancel less than 1 day prior to the start of the course. You can substitute another facilitator from your company to go in your place if you cannot attend. Substitutions will be accepted up to 1 day prior to the start of the course. Wiley reserves the right to cancel the course at any time. You will receive a full refund for the cost of the training (does not include the cost of the facilitation kit). Commit to 5 weeks of course participation, each week consisting of 3-4 hours of self-directed online work and a 90-minute instructor-led live virtual session. Be willing to be recorded during the live session—learners and faculty will have access to this recording for the duration of the course to aid in the learning experience. Active participation in the live session (instructor-led). Satisfactory, on-time completion of all self-directed learning activities. Satisfactory completion of the final exam within 72 hours of the final, live session. Participation in survey to provide feedback concerning the product and experience. If a participant fails to pass the final exam, a retake will be assigned. A laptop or desktop computer (Mac or PC) and a phone line for audio are required. This course does not support use of tablets or VOIP.